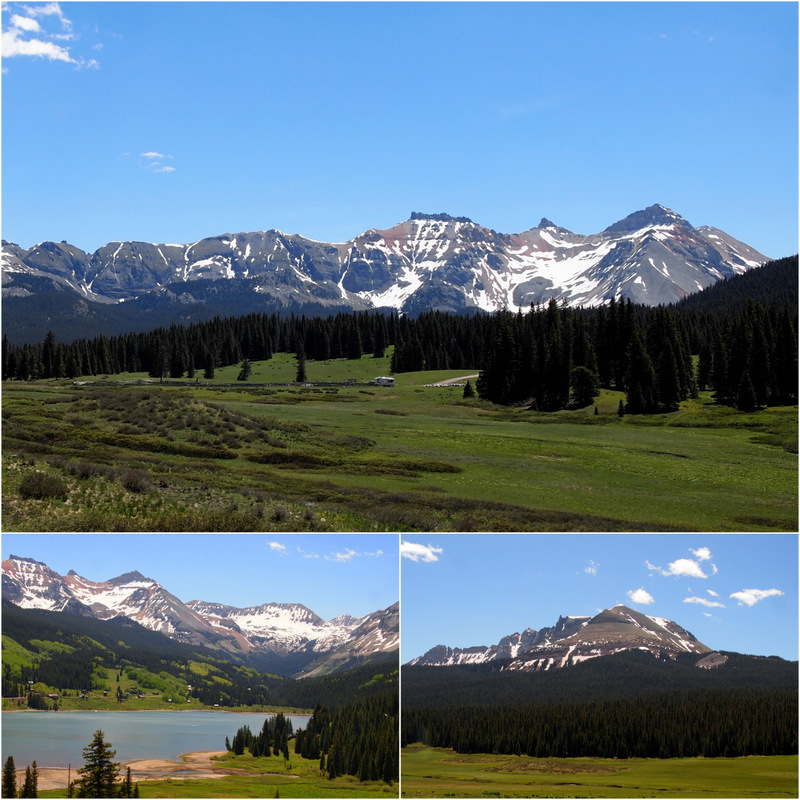 Even though we’re staying near Durango, our first Colorado adventure was in the small mountain town of Telluride. We rarely take long day trips, but since we plan to stay in the same place for next few weeks, a wider range of exploration was easily justified. 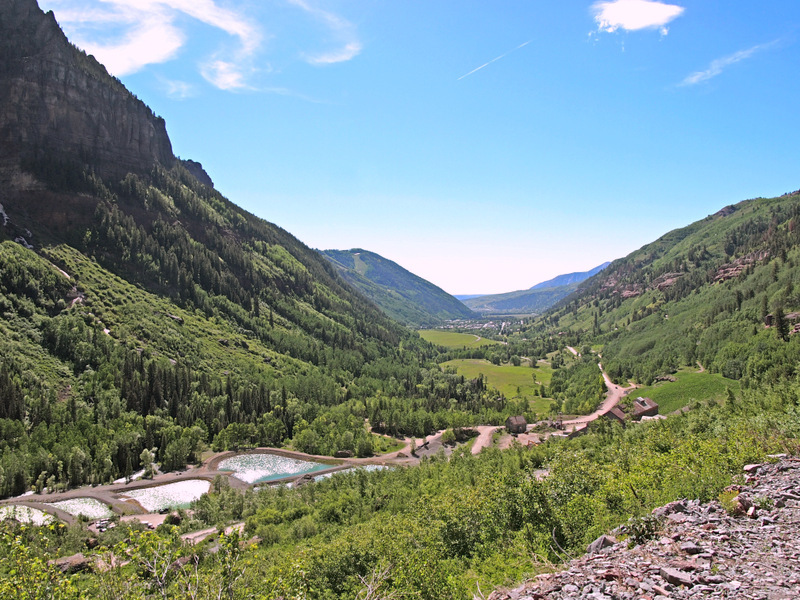 Telluride is one of the towns that we skipped over last year. We would like to stay there this year, but since there’s only one campground in town- a place that is notoriously difficult to get into- who knows if it will happen. So we decided to drive up and spend the day. The two hour drive was beautiful of course. For most of the journey we traveled through a valley next to a rushing stream. 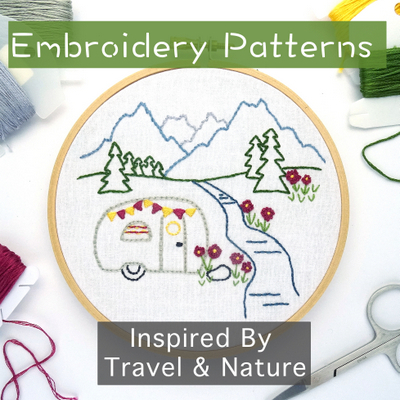 We passed many places where we would love to camp, including about 5 or 6 different national forest campgrounds, and some boondocking alongside the river where we spotted a couple RVs. Sadly, these deep mountains valleys tend to prohibit any kind of usable cell service, which means we won’t be staying here anytime soon. As we neared our destination the mountains grew taller and the presence of snow more prolific. Soon we were at the top of Lizard Head Pass. Somehow I didn’t get a photo of the prominent mountain peak that is said to resemble a Lizard head. Probably because it was out the driver’s side window, and I was too busy snapping pics out the passenger side. More great boondocking up here in the pass. Same deal though with the lack of cell service. We crested the top of the pass at 10,222′ and began our descent into town. More mountains appeared in the distance. The mountains in Colorado are endless. I can’t help but think about those explorers who first traversed this state by foot and on horseback. It must have seemed like a never ending maze of giant peaks and valleys, followed by more giant peaks, and then a river to cross, and then another giant peak. At least these days we know that after climbing up a tall mountain pass, we’re almost guaranteed to find a small town in the valley below with a store selling cold drinks. Telluride looks exactly like I thought it would. 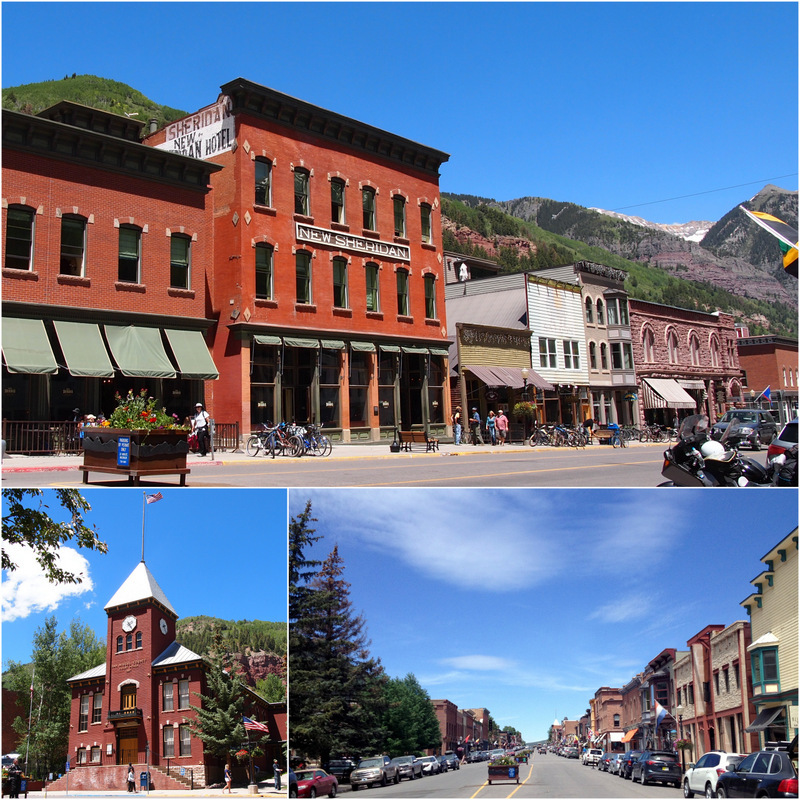 The town is nestled down in a narrow box canyon with a picturesque main street full of old victorian style buildings. The surrounding streets are packed tightly with charming houses that grow larger and larger as they creep up the hillside. In comparison to some of the other Colorado ski towns that we’ve visited, I would say it’s less commercial than Breckenridge, but more tourism focused than Crested Butte. We easily found a parking spot on the street (free on Sundays), and spent about an hour wandering around town. One of the places we wanted to check out was the Town Park where they have a campground. This is the only campground/RV park in town. Word is that to get a spot there in the busy season you generally have to wait in line in the morning – and hope it works out. The campground is closed to the public when it is used as an event venue. These events happen quite frequently throughout the summer. In fact, there was one going on when we visited. The Telluride Bluegrass Festival is one of the largest events in town, and even though it hadn’t officially started yet, the campers had definitely arrived. We walked through the campground and it was a complete zoo. Tents, tents, and more tents were set up on any available surface, with a few RVs wedged in here and there. Because of the chaos it was hard to see what the actual sites looked like. Who knows if we’ll make it back to try for a site later in the summer. After walking around town we decided to take a trip up the mountain on the FREE gondola. Yup, free! Unbelievable right? Nothing like that is ever free. A few weeks ago in the tiny town of Red River they tried to get us to pay $17/person to ride up their charlift. Umm…no thank you. 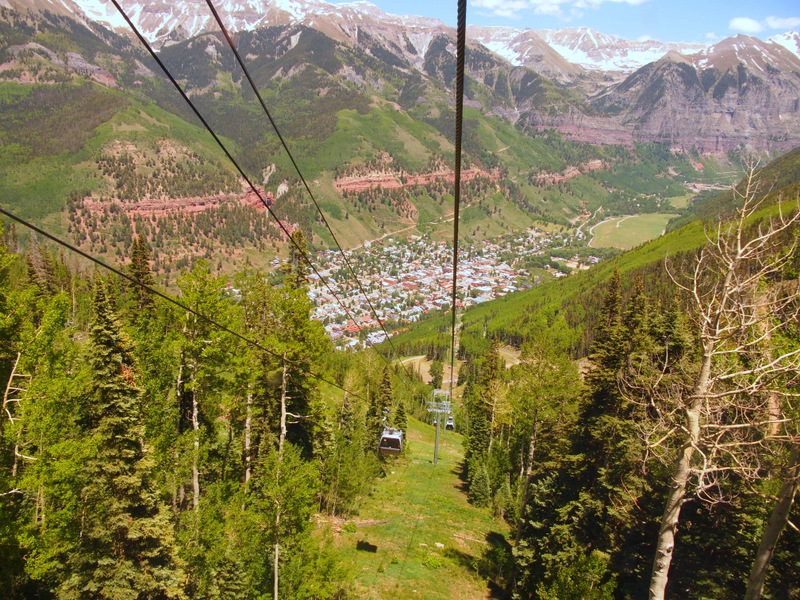 The Telluride Gondola is really cool because it not only takes you to the top of the mountain where you can get off and ski, hike, mountain bike, have a picnic, dine at the mountain top restaurant, or just gaze at the view, but it’s also a method of public transportation that travels between downtown Telluride and the Mountain Village. Pretty cool right? We rode to the top of the San Sofia section where we got off and had a little picnic while taking in the views. At the top of our gondola ride. The bottom right photo is a spot where they have weddings. What a view! Next we headed over to the far end of town for a hike up to Bridal Veil Falls. 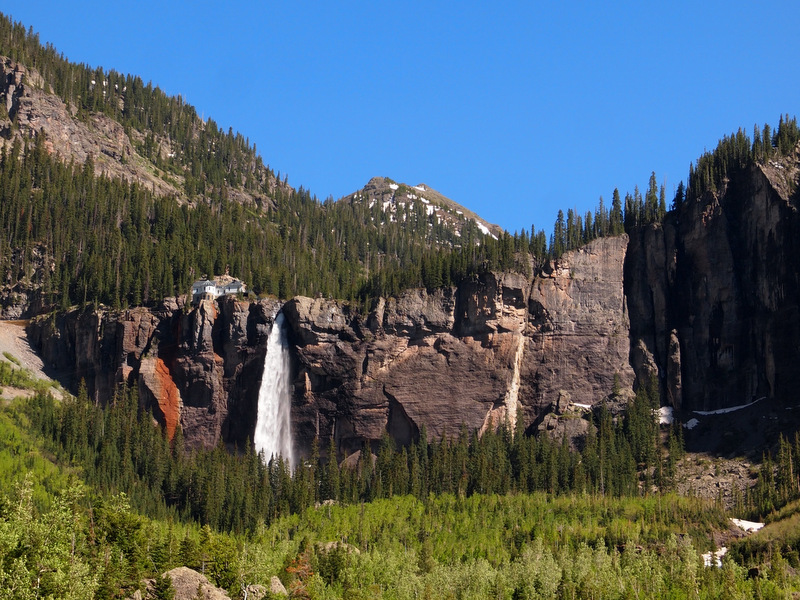 At 365 feet in length, these falls are the tallest in Colorado. 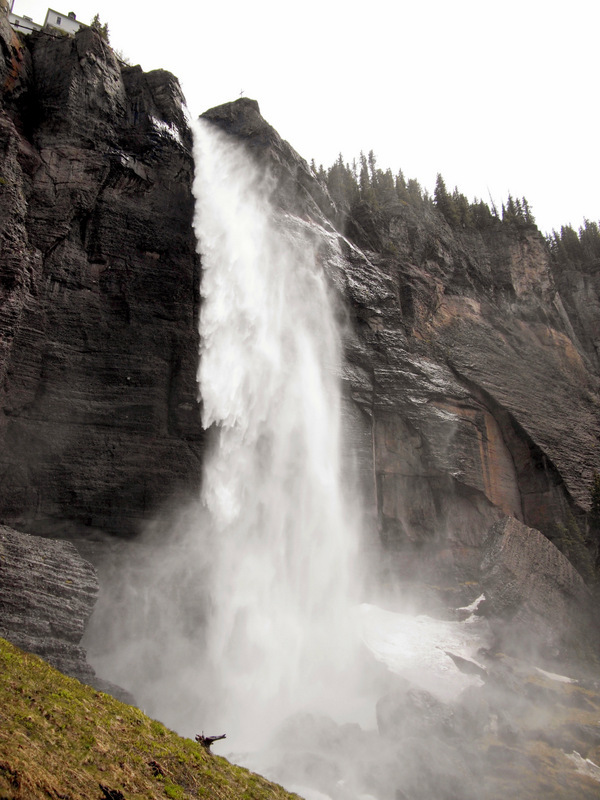 That building you see at the top of the falls is the Bridal Veil Powerhouse. This historic building has been around since 1907 and is still in operation today, providing power to the town of Telluride 1,400 feet below. The road up to the top of the falls is open to 4-wheel drive vehicles, OHVs, hikers, and bikers. The majority of visitors on this busy sunday elected to drive to the top, but our goal was to get a little exercise, so we parked and hiked. The hike up was not terribly strenuous, and only 1.8 miles long. About half a mile short of the top we arrived at the bottom of the falls where the wind blown falls showered down on us. We scrambled through the woods for a close up view, risking the cold water for a photo. At this point we decided not to go the rest of the way up the trial. It was getting late in the day and we still had a two hour drive home. Besides, we were pretty happy with our close up waterfall view. On the way down we enjoyed another look at the town below. 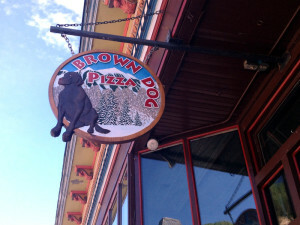 Our day in Telluride ended with dinner at Brown Dog Pizza. We chose this placed based solely on the name, and ended up with a so-so pizza that cost more than it was worth. The salad was really good though, and the atmosphere lively as the place was filled with locals watching the World Cup. All in all we had an excellent day in Telluride and hope to make it back for another day trip, or maybe even a week at the campground if we’re lucky. Wow, Telluride has grown since I was there in the 90s. At that time, a young couple owned the power plant and there was no gondola. Progress. Sounds like it really has grown! We totally fell in love with the whole Lizard Head Wilderness when we stayed there a few years back, but like you said absolutely ZERO internet. We couldn’t even get a radio station at our campsite LOL. Amazing area, though. Oh I’m so jealous that you stayed up there! It was such an incredible spot. We might have to try and go back just for a weekend trip before the summer is over. Ridiculous right? $17 is way to much for a ride up that tiny mountain. They would probably get more takers, and make more money, if they lowered the price. Nice to see a free tram ride. Today we are headed for Wallowa Lake where they want $28/each to ride their tram. Needless to say we are not riding that tram! 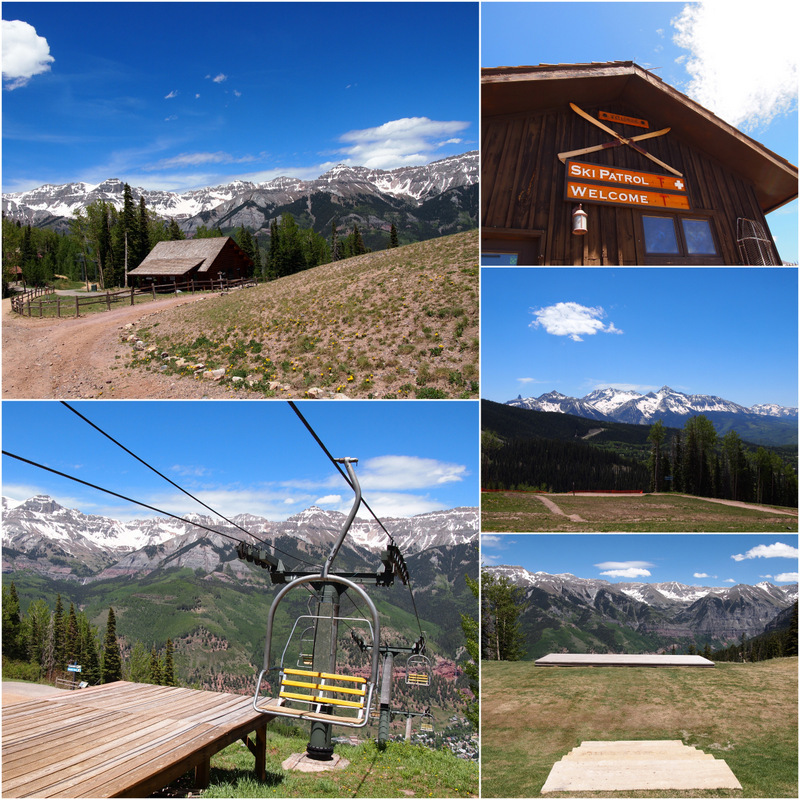 There sure are a lot of pricey, fancy, resort towns in CO…but they sure are pretty! $28!!? That’s way too much. This is the first time we’ve ever come across anything free in one of these CO ski towns. I figure the resort probably makes enough money off the skiers and snowboarders in the winter that they can afford to let the tourists ride for free. You didn’t need to hike to the top of the falls. You got a gorgeous photo from where you were. You may be thinking of Ingrid from LiveLaughRV. She wrote about Telluride and the tram not long ago. I doubt they’ll start charging anytime soon. It’s too much of a draw for tourists to change it now. Our thoughts exactly on the waterfall! 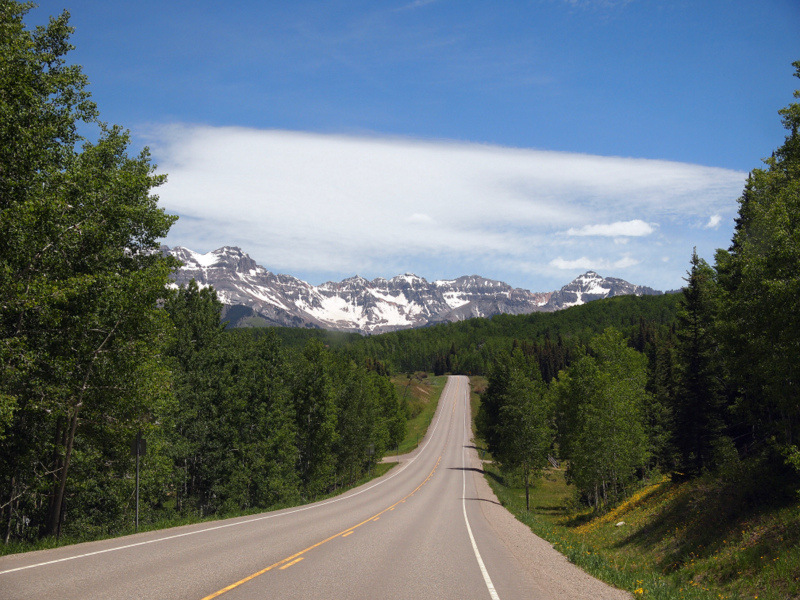 I love those day trips where the drive is as awesome as the destination – likely to be the norm in that area! Even public buses charge a small fare so a free tram is amazing. I think you definitely saw the best part of the Falls :-). Thanks for the info on the boondocking options along your travels – especially when they are in areas that you can’t utilize. We won’t need coverage (will want it sometimes certainly) so these would sure work for us! You’re right. Pretty much anywhere you drive in Colorado is an adventure! I am glad you enjoy the boondocking info. We’re constantly on the look out for new, free spots so I’ll continue to mention them. 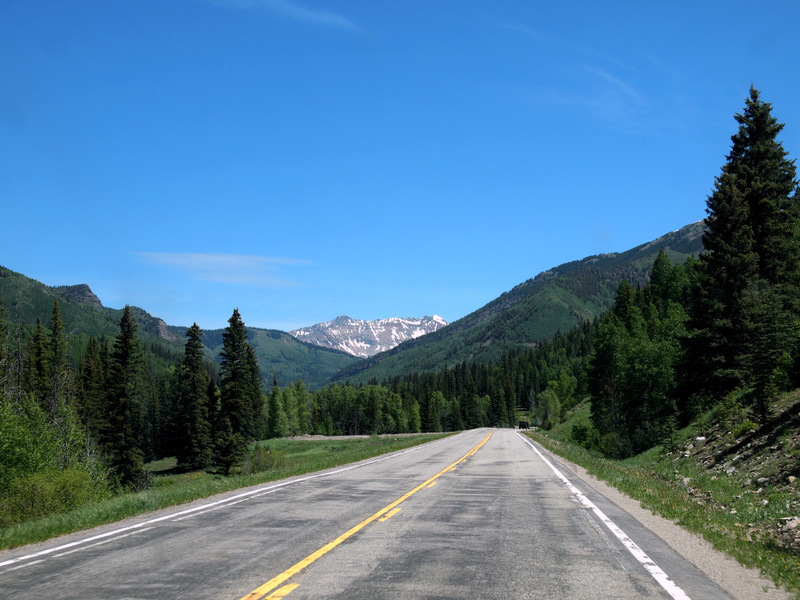 By the way, I forgot to say that the road we drove on was 145 between Dolores & Telluride. If you don’t need cell service you will find all sorts of great camping opportunities on this route. I’m already looking forward to going back to CO when we start to head back towards FL – one of our favorite states too! Would love to check out Telluride – we couldn’t do it last year since we didn’t have a car – maybe we can fit it in this time! Colorado is one of our favorite states as well. It’s fun to explore it for the second year in a row. Gives us a chance to re-visit favorite places and discover new ones. I hope you make it Telluride. There’s lots more to do around town that we missed out on including a different waterfall hike. We haven’t been to Telluride in 20 years. It looks as beautiful as ever. You and Ingrid are making me want to change our plans for next year so we can head to Colorado. Do it! Colorado is such an amazing place with endless places to explore. It also has perfect summer weather if you get high enough up in the mountains. I sound like a broken record, beautiful pictures and another of our favorite places. 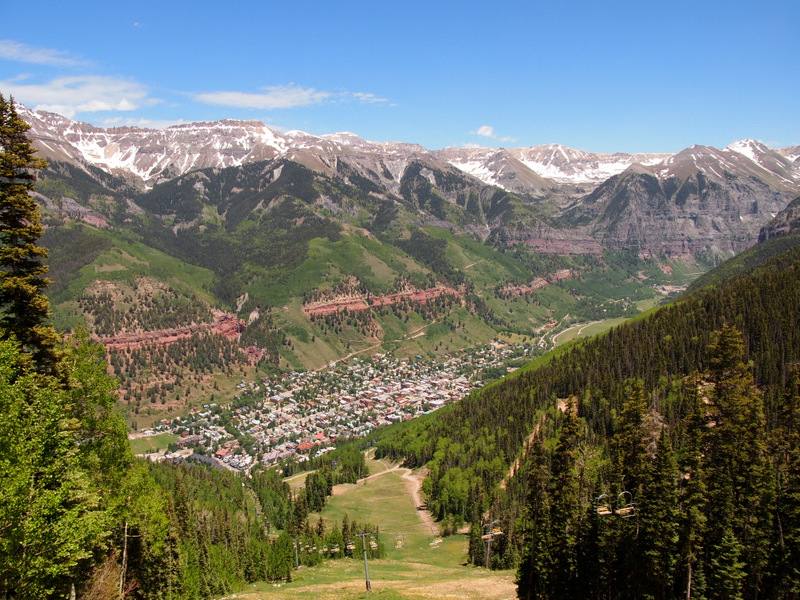 We are heading to Telluride in early July and again in early October for a hiking weekend. Love Lizard Pass although we have only driven through not camped yet. But someday we will. I bet it’s even more beautiful in October!